I made this tofu yaki udon last weekend because I felt like Mr. Delightful Plate and I had been eating too much meat during the week. I used to be a big meat-eater. Just a few years ago, I would not feel satisfied at all if my lunch or dinner didn’t contain meat. Things have changed. It is no longer easy for me to digest as much meat as before. I guess it’s not abnormal at all for our taste buds to change over time. I find myself dislike some favorite childhood foods while some foods I used to dislike start to grow on me. 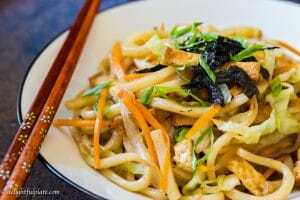 Okay, let’s get back to the main topic of today’s post: tofu yaki udon. 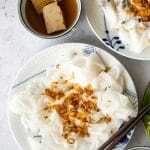 I love tofu, and all Vietnamese families eat tofu at least once every week. 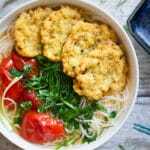 The most traditional way to enjoy tofu in Vietnam is to deep fry it and then dip it in fish sauce. I know it sounds so simple, but sometimes simplicity is the best. In this recipe, you will need to fry the tofu, and it’s best to use firm or extra-firm tofu. Soft tofu is more delicate, and may break apart easily when we stir-fry it with udon noodles and other ingredients. An important step to get crispy fried tofu is to press it with something heavy to remove excess water. 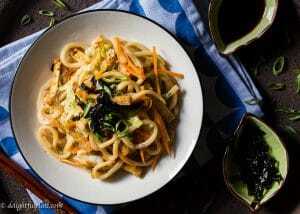 I chose udon noodles for this recipe simply because udon is our most favorite Japanese noodles. 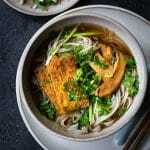 It is a thick wheat noodle with a chewy texture, which is very addictive by the way. I strongly recommend using frozen udon noodles because they are thick, chewy and delicious just like what restaurants serve. 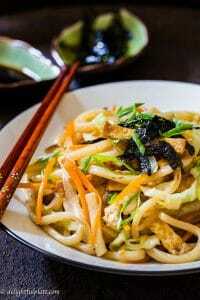 I discovered frozen udon through this post by Nami at Just One Cookbook. Before I knew about it, I tried several dried udon noodles at Asian grocery stores, and I was so disappointed because they are so thin and don’t have the chewy texture. After reading Nami’s post, I bought the frozen Sanuki udon and was extremely pleased with it. Please look at the refrigerated section at your Asian grocery stores to find this udon. 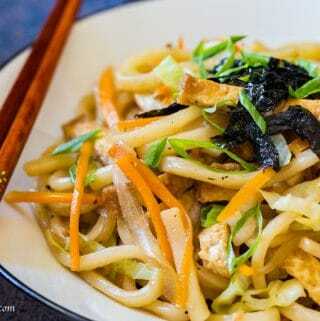 I know my tofu yaki udon is not authentic but it is tasty and easy to make. Besides tofu, I also use cabbage, carrot and onion. 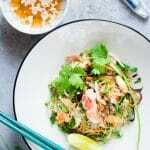 You can top it with seaweed strips (or bonito flakes if you don’t need it to be vegetarian) for more flavors. This vegetarian tofu yaki is tasty, quick and very easy. It is one of my go-to dishes whenever I want a meatless meal. Use damp paper towel to gently clean the kombu piece, then soak it in 3 tablespoons of water. If you don't have or can't find kombu, you can use vegetable stock. Remove the tofu block from its packaging. Line a plate with paper towel, place tofu on top. Set a heavy plate with something heavy on it over the tofu. Press the tofu like that for 10 minutes. While the tofu is pressed, prep the vegetables: shred cabbage, julienne carrot and slice onion. After 10 minutes, pat the tofu dry and slice into 1/2'' thick pieces. Fry them in a pan over medium-high heat until crispy. Transfer to a plate lined with kitchen towel to absorb excess oil. Cut into thin strips. Prepare udon noodles according to instructions on the package. If you use the frozen udon I recommend, you just need to boil it for 2-3 minutes. Place a pan over medium-high heat, add some oil and add onion. Stir and cook for 2 minutes until onion is fragrant. Add cabbage and carrot. Stir frequently, add a pinch of salt and pepper and cook for about 2 minutes. Add udon noodles, tofu strips, soy sauce, mirin, sesame oil and the liquid from soaking kombu (discard the kombu, we only use the liquid). Mix well and adjust seasoning. Transfer to serving plates and top with scallions and seaweed strips.